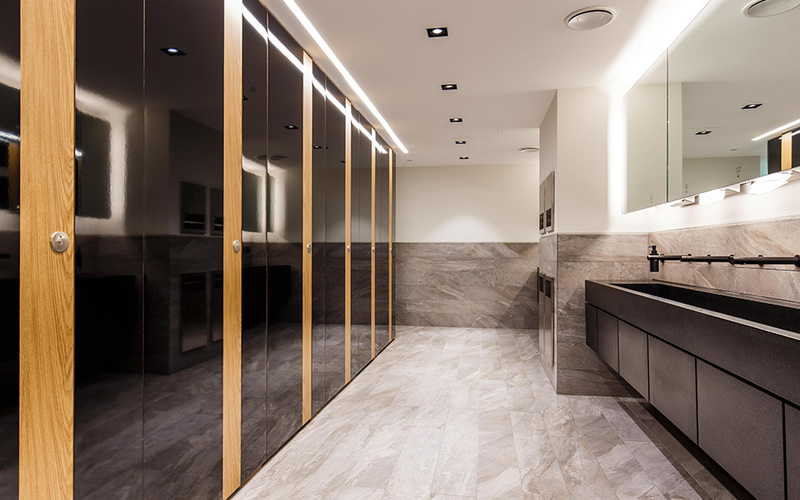 We’re proud to continue working in partnership with international construction services company ISG, delivering some truly eye-catching washroom designs and interiors. Earlier this year, we announced that we’d been selected to be a tier one supplier to ISG, making us one of only a handful of tier one suppliers in the UK. Find out more about what this means for us by reading the full story here. We’ve completed works with ISG to install new washrooms on all six levels of Building C within Imperial College London’s new White City campus. As part of this project, which completed in the summer, we installed our full height Marcato toilet cubicles in a light sky blue Formica finish together with crisp white Corian vanities. As well as completing a refurbishment at ISG’s London head office on Aldgate in central London, we’ve also been working with our partner company Cre8 Joinery Solutions on a large-scale refurbishment for Hogan Lovells at its 12-storey London head office in Holborn. Works are currently ongoing and will be carried out while the building remains occupied by the Hogan Lovells team. In addition, this year Cre8 Joinery has completed works with ISG at ASOS’ dedicated customer relations office in Leavesden. During the 12 week project, the Cre8 team fitted out five floors of the building with high specification bespoke joinery and installed full height Alto laminate toilet cubicles plus quartz Caesarstone vanity tops in the new washrooms on each floor. The Cre8 team is about to start working with ISG Agility on several new projects including the fit out of new offices at the former Richmond Magistrates Court, Maple House at UCL, and a project on the 36th floor of the cheese grater building at 122 Leadenhall Street. The team has also just been awarded a second project with ISG at ASOS in Leavesden, with work due to start on site in December. Don’t forget you can follow the progress of all our projects on our social media channels on Instagram, LinkedIn and Twitter.